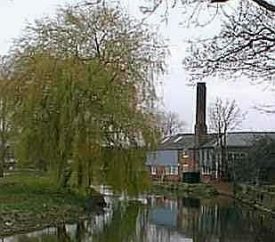 Just a short walk from where I live at Ironbridge Works, Newport Pagnell an unusual family business sits on the bank of the River Lovat. Cowleys have been making the finest quality parchment and vellum since 1870. 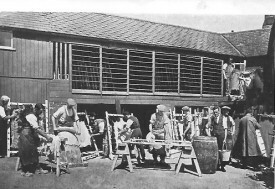 The premises were built on the site of an old tannery. The skills have passed down through over four generations in an unbroken line, by word of mouth, to the present day. It is the last remaining establishment of its kind in the country. The craftsmen spend many years training and accumulating experience to master the craft that is still carried out by hand, using techniques and skills little changed for 2,000 years or more. Parchment and vellum are remarkable ancient materials proven to stand the test of time. They possess exceptional properties which contribute to a stunning quality of work. For centuries they have been the material of choice for prestigious documents. It has exceptional quality, strength, longevity and a unique appearance. 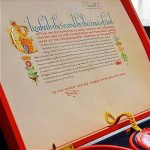 The term parchment is a general term for an animal skin which has been prepared for writing or printing. Parchment has been made for centuries, and is usually calf, goat, or sheep skin. The term vellum from the French veau refers to a parchment made from calf skin. The manufacture of parchment is quite involved. After the skin is removed from the animal and any hair or flesh is cleaned away, it is stretched on a wooden frame. While it is stretched, the parchment maker or parchmenter scrapes the surface of the skin with a special curved knife. In order to create tension in the skin, scraping is alternated by wetting and drying the skin. The parchment is scraped, wetted, and dried several times to bring it to the right thickness and tautness. Sometimes a final finish is achieved using pumice as an abrasive followed by chalk in order to prepare the surface of the skin to accept ink. Whether a quill, pen or brush is used lettering and illumination on real parchment or vellum has a depth, clarity and luminescence that set vellum well apart from paper. Intense vibrant colours and incredibly fine detail is achievable. These remarkable qualities can never be matched by so called ‘parchment’ imitations or ‘parchment paper’. Examples of where materials supplied by William Cowley have been used to support the revival of traditional methods and craftsmanship. The supply of all the vellum for perhaps the largest and most exciting Calligraphic and Illumination project of modern times: the St John’s Bible, completed in 2011. Another fine example of British craftsmanship is the magnificent re-creation of a Mappa Mundi, which hangs in the refurbished Great Tower of Dover Castle. Artists ‘Black Letter’ researched and used traditional pigments for this stunning work. Commissioned by English Heritage, the Mappa Mundi used the largest calf skin William Cowley has ever supplied! 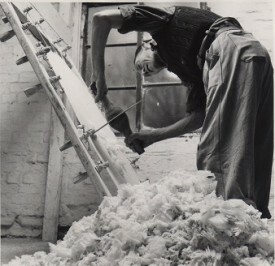 Parchment was also used in lacemaking when the industry was thriving in Newport Pagnell. Women would sit outside their homes in daylight, with the lace attached to a pillow resting on a stool (called a pillow horse). Colourful bobbins holding threads were twisted around pins in perforated parchment bearing the pattern for the old point lace. Vellum was commonly used in bookbinding. It could be used to cover a wooden or cardboard core, or alone without any backing. Many vellum bindings are simple and undecorated. Vellum was often used to cover less valuable or common books. However, it could be decorated in a number of ways. Blind stamping or impressing a design into wet vellum with a hot punch or roller was a common way of decorating vellum bound books. Sometimes the designs were also gilded. One decorative technique invented in the late 18th century involved the use of very thin and transparent vellum. A scenic picture, coat of arms, portrait, or other design would be painted on the underside of the transparent vellum. This protected the painting from smudging or damage from handling. Thank you to William Cowley for allowing me to reproduce photographs from their collection.